Meet Kelsey Hayes, a new graduate of high school, looking for a summer job. She finds temporary work as a worker at a circus in Oregon where she lives. Little does Kelsey know that taking this job will change her life. 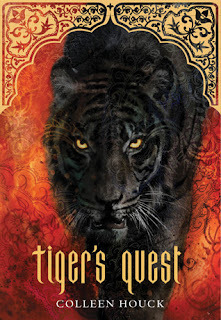 She becomes attached to a white tiger in the circus, Dhiren, and when he is sold, she is asked to be the tiger's caretaker on his trip to his new home in India. When Kelsey gets there she ends up stranded with the tiger in the middle of the jungle. 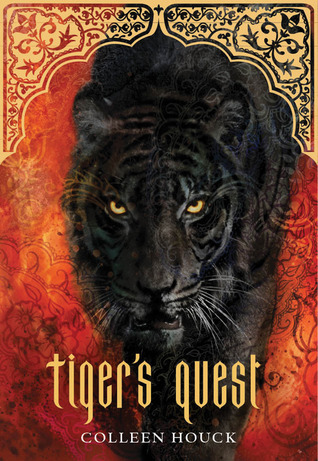 She is stunned when the tiger transforms into Prince Dhiren from the seventeenth century who has been cursed by a magician. He needs Kelsey's help to break the curse. They travel through India seeking those people and places that can help them with the curse and along the way they fall in love. Follow Kelsey on her journey to India and love. This novel will have you turning page after page until you finish it! Colleen Houck weaves a story of action, romance, danger and fantasy that you can't imagine! I could not put this book down until forced because I was so tired and couldn't read any longer. Then it was the first thing I picked up in the morning! A must-read for any avid book reader and romantic at heart. Kelsey's journey isn't your typical one, but it will leave you wanting more! Hooray for Colleen Houck who has created a new world for me to be a part of! This book is the sequel to Tiger's Curse. Amazingly, I found it even harder to put down than Tiger's Curse. This story is a continuation on the first. Kelsey has decided to give up her own happiness for her first love, Dhiren, or Ren and she calls him. She decides to move back to America and leave Ren behind in India. 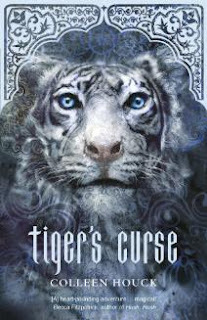 Kelsey loses herself in college life and eventually meets a great guy, Li, who has no significant drama in his life (such as being cursed as a tiger). When Kelsey is beginning to think she could be able to put Ren behind her, it seems that her past returns to bring her back into a life of romance and danger. This series just keeps getting better and better! I can not wait for the next book, Tiger's Voyage, to come out. I don't want to wait two more months to see what will happen next in Kelsey's life. These books draw you in from the first page and will have you reading until your eyes are burning with fatigue! But they are worth the pain! I highly recommend this series and promise that you won't be disappointed in it! Five stars for The Tiger's Series by Colleen Houck!!! These are my new favorite books! This novel is by a new author, Kimberly Job. The story is about a woman, Stephanie Roberts, and her struggle to overcome abuse from her husband. This is her journey as she tries to break free from him and start a new life. She meets a man named Jared Wakefield and he becomes a great friend and support to her. She isn't sure if she can give him what he needs as she is trying to trust again and overcome her own fears. Will she learn to trust again and can love overcome any obstacle? If you want a page-turner, this is the book for you! I could NOT put it down! I was frustrated that I had to put it down at points to deal with real life. This story is gripping from the first few pages and will take you on a journey of heartache, pain, love lost and love found again. If you want a good read this IS the book! Congratulations Kim on a fabulous first novel! I enjoyed every page and look forward to the next great book! Thanks for the opportunity to read it! This book that I read is by author Sierra St. James. The book is about a girl named Ellie who goes to take care of her eccentric Aunt Bertie for the summer. Her Aunt Bertie is convinced that Ellie and Dr. John Flynn are meant for each other. Aunt Bertie is constantly telling everyone that Ellie and Dr. Flynn are dating when the truth is that they aren't and they can't seem to get along at all. In my personal opinion, the book was an enjoyable read, but left me completely wanting more. I felt the ending to the book left something to be desired. So although I enjoyed reading it, I wasn't happy with the amount of information the conclusion gave me. I have yet to find out if there is a sequel to this novel. It was written in 2004 and I have found other novels by the author, but am unsure whether they are a companion novel to this book. I read this book by Jennie Hansen and at first it confused me. I was trying to figure out what was really going on with the characters. Laura is left fatherless after a bad car accident and her Aunt Alice takes her and her mother in to help raise her. After her Aunt passes away she discovers papers indicating that she is married and has been for years. Follow the story of Laura as she tries to find out if she is really married and entitled to half of her father's ranch. This story will keep you wondering what will happen up until the very end. All in all, I liked this book. It was very different and at first, a bit confusing. But as you begin to sort out all of the details, you find yourself swept up in the mystery of Laura's supposed marriage and entitlement to her father's ranch. I do recommend this book to anyone who likes a book that will keep them wondering until the very end.